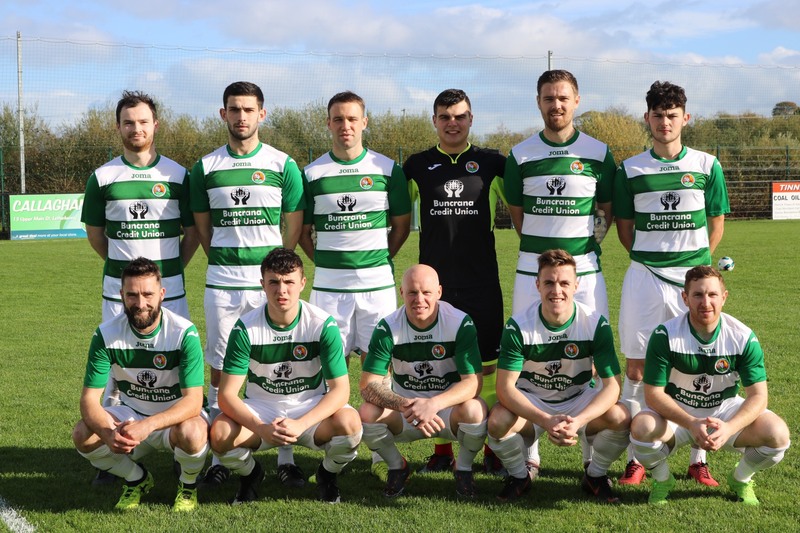 Cockhill Celtic’s dismal record in the FAI Intermediate Cup continued on Sunday when they were comprehensively beaten by Letterkenny Rovers in this second round meeting at Leckview Park. Former Cockhill underage player Jonny Bonner scored twice for Letterkenny and new signing BJ Banda was also on the mark on a day when nothing went right for Cockhill. The Inishowen side trailed 2-0 at the break but had a man sent off right at the start of the second half when midfielder Daniel Martin Doherty picked up a second yellow card for an off-the-ball incident. And when Gerry Gill then saw red on 68 minutes when punished with a second booking following a silly challenge on Paul McVeigh, Cockhill’s race was run. At that stage, Letterkenny were 3-0 to the good, and playing against nine men, Rovers were able to ease to victory. With Ryan McConnell and Conor Tourish again so commanding at the back, and Chris Malseed and Kevin McGrath also catching the eye, this was a fine display from the home side. Beaten semi-finalists in this competition last year, they got off to the perfect start when with just 33 seconds gone on the watch, McGrath found the net after a brilliant move from the kick-off. After that, it was a very evenly contested first half and neither side created much in the way of chances. Jason Breslin did well to clear a Chris Malseed flick-on from under his own crossbar while at the other end, Rory Kelly made a fine save when Mark Moran’s curling effort looked bound for the top corner. But the big moment of the match arrived as the game entered injury time at the end of the half. From a throw-in, Banda was fed possession in the box and when Bonner ran on to the ball, he produced a clinical finish with his weaker right foot. Cockhill needed a good response after the break but instead they were hit with a red card when Daniel Martin Doherty picked up his second booking. It forced Cockhill into going three at the back as they chased a way back into the contest. But Rovers are a dangerous attacking force and Banda killed off the Cockhill challenge on 62 minutes when scoring the goal of the game, racing into the area and rounding keeper Lee McCarron to score. Frustration seemed to get the better of Gerry Gill minutes later when he needlessly fouled Paul McVeigh and was punished with a second yellow. Bonner fired home the fourth from the spot on 84 when substitute Declan Sharkey was fouled in the box. And McVeigh rounded off the win with a neat finish on 89 minutes. Letterkenny Rovers: Rory Kelly, Ciaran Kelly, Jonny Bonner, Ryan McConnell, Conor Tourish, Chris Malseed, Kevin McGrath (Chris Flanagan 82), Christy Connaghan (Brian McVeigh 82), Darren McElwaine (Declan Sharkey 73), BJ Banda (Odhran McMacken 79), Luke Nelis (Paul McVeigh 66). Cockhill Celtic: Lee McCarron, Malachy McDermott, Lee McColgan (Paul McDermott 55), Jason Breslin, Peter Doherty, Gerry Gill, Daniel Martin Doherty, Jimmy Bradley, Gerard McLaughlin (Bart Wesolowski 55), Mark Moran (Laurence Toland 72), Brendan McLaughlin. Assistants: Packie Coll, Sean O’Donnell.